I´m just going to look at that picture a bit longer and pat myself on the back. What do you do to celebrate a writing related achievement? 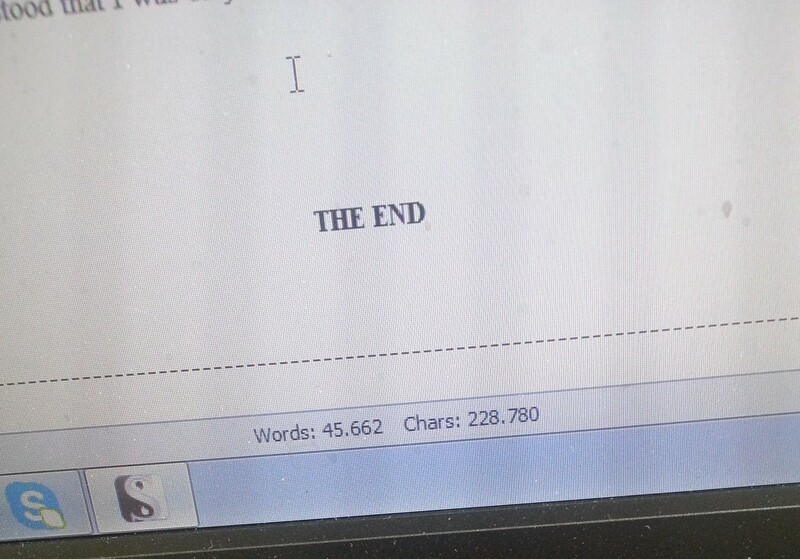 There’s definitely a great feeling just looking at “The End” especially after all the work you’ve put into the novel. Still haven’t celebrated finishing my first, unless you could finally relaxing and sitting down to watch Castle. I apparently decided to throw myself back in the fire and start on the next. Congrats! I don’t know what I will do when I finish this draft…probably also write a celebratory blog post! I’m so impressed with your speed and focus. Way to go! Yay to go, Elodie! Finishing a first draft is such an accomplished feeling… I hope you get to revel in it! I’m proud of you, lady! The END! Rock on! Go you! What a great feeling to be finished with a draft. THAT IS AWESOME!!! Congratulations! I really hope you’ll send this one my way when you’re ready! Congrats again on finishing!!!! If you ever need a beta reader, let me know!